Home › Blog › Vivienne Harr: When life gives you lemons sell lemonade and end slavery. Somewhere it is written, the youth shall lead. 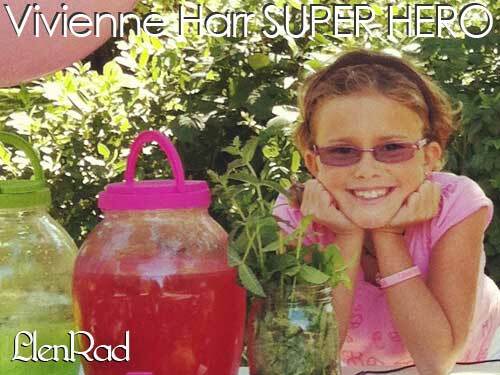 Eight year old Vivienne Harr has her mind set on changing the world. Have you heard about this amazingly inspirational story? What do you think about a child having this grown up type of idea like making the world a better place? Have we grown ups lost the point of life? I post my analysis on this website about what’s happening and honestly sometimes it really is discouraging to constantly see continuous exploitation that is happening daily with NO ONE apparently doing anything to stop it. The Prime Thug won’t prosecute anyone because well, he is the Prime Thug. Sometimes it can get very discouraging. Ususally about that time you hear about a story that re energizes you like this one. Vivienne Harr is not a subscriber to the status quo. When she heard about the horrible atrocities that are our reality she wanted to do something about it. Eric Pfeiffer broke this story about this young california girl who decided to take a stand, a lemonade stand to raise money for her charity NOT FOR SALE. Imagine that. Someone who is not obsessed with Justin Bieber all day or the latest app on her iPhone or obsessed with how big her ears are. Instead her organization has a goal to raise $150,000 to stop human trafficking which results in countless amounts of suffering for people especially children. WOW. Did you know that child and human trafficking and forced labor incidents have been reported in all 50 US states? Who benefits from this exploitation? Who is paying? What is happening today is like a rerun of the same movie. In the 1800′s and prior in North America it was African Americans who were being slaved by the agriculture industry now we see the same process happening again. This time instead of being exclusively blacks the slaves are from all over the world. There are cases after cases of people being abused by labor intensive companies. Agriculture has just been in the press more due to seasonal harvests I guess but there are plenty of other industries that are hurting people for money. This is inhumane we all deserve better than this. I hope you join me by doing something about this like contributing to a charity like NOT FOR SALE or something. 1love. @freedommmc thank you for a beautiful article. my papa read it to me. i love what you said. thank you for MAKING A STAND! ‹ Ten Signs you might be a trendie.